“Unknown Hungary” written by Victor Tissot and translated from the French by Mrs. A. Oswald Brodie was published in 1881. It contains this wonderful description of a visit to a Hungarian peasant cottage. “Here we are in the kitchen carefully whitewashed every spring, and in the midst of which is enthroned a large square oven four feet high. Saucepans and frying-pans are conspicuous by their absence, and are replaced by large earthen pots; the walls, however, are artistically decorated with dishes and kitchen utensils of the brightest pewter. On the right and left of the kitchen are two tidy chambers, simply furnished, and indicating a prosperity that it does one good to see. An oaken bench, fixed to the wall, runs round each apartment. In a corner, on a very low bedstead, feather-beds are piled to the ceiling. These feather-beds, in all varieties of covers, are the pride and luxury of the mistress of a Hungarian household. A walnut-wood wardrobe guards as a precious treasure the linen woven in the winter. An earthenware stove like a monument, on which during very cold weather people sleep, occupies the place of honour in each room. Upon some shelves are ranged cups and globes, a mirror, a crucifix, or an image of the Virgin; lithographs representing Napoleon 1., Francis-Joseph in the costume of king of Hungary, and Deak, complete the furniture. 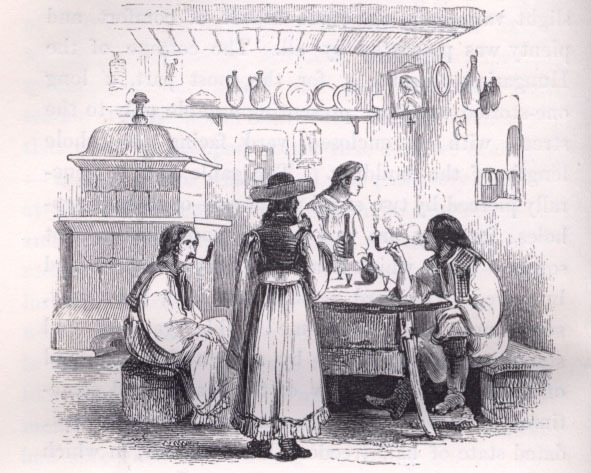 The illustration of the cottage is from John Paget’s “Hungary and Transylvania” (http://bit.ly/HvCW7h). Search Google Books for these and many more accounts of life in Hungary in years past. This entry was posted in 1800s, 1830s, Austro-Hungary, Extras, Hungary and tagged Google Books, king of Hungary, Life in Hungary, Social History, top10, Victor Tissot by edesorban. Bookmark the permalink.